The McAllen Memorial cheerleading team sat quietly by the stage and waited to hear who would be this year’s Class 6A UIL Spirit State Champion. They certainly didn’t expect a repeat after having the slightest of “flaws” in one of their final day routines. Their overall body of work, however, was just too good and to their surprise for the second straight year they claimed that championship on Saturday at the Fort Worth Convention Center. But the squad had been talking about this since last year, he said. More than half of the 24 members of the team are new this season. Senior leadership, however, led by captains Karina Falcon and Cassandra Sauceda, got the team into harmonic step in time for the state’s biggest event. UIL began this competition just four years ago, so now the Mustangs have captured the biggest title in two of the four years, with this year edging out Southlake Carroll for top honors. The Mustangs were one of 54 schools in Class 6A Div. II. The first day had three preliminary rounds, each with a different element. First they were judged on the school fight song, next the band dance, like a performance they would do during a timeout. The third round element was a crowd-leading cheer. Memorial won the fight song and cheer rounds, and after the first rounds they were in first. The top 20 advanced to the championship rounds. This year, the Mustangs were given an offensive situation that had to have the word “score” in it. Ramirez said the captains reacted perfectly, calling for the right cheer in that situation. The Mustangs returned home to a spirited rally on Sunday with teachers, students, administration and others welcoming back the two-time state champions. 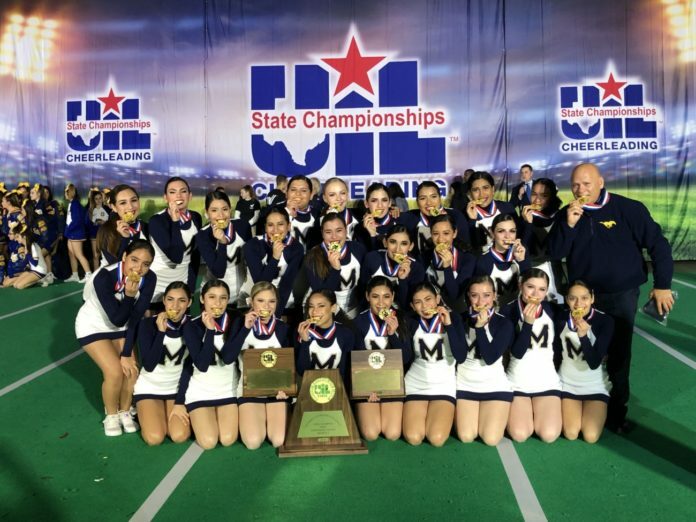 Watch the McAllen Memorial Cheerleaders react to winning the state championship. Henry Miller is the interim sports editor for The Monitor. You can reach him at hmiller@themonitor.com or (956) 683-4472.